What will dominate real estate conversations in 2017? In the global macroeconomic picture, 2016 was largely seen as volatile. The world can’t wait to move on to the next. Nonetheless, having avoided a bubble in 2015 and getting past a slowdown last year, the UAE property sector has done comparatively well. Many new landmark projects have been announced and the newly launched Dubai Water Canal is emerging as a major talking point, ending the year on a happy note. Analysts are now cautiously dipping their toes into optimism, suggesting the property market is poised to recover next year. However, global headwinds may affect Dubai as many markets battle uncertainty. in 2020 and other mega developments. “These will help sustain or lift public sentiment, which has proved instrumental in keeping the emirate’s economic growth profile the most positive in the region,” the report states. According to Chestertons, prices came down in many residential locations across Dubai last year. Dubailand saw a 13 per cent downward movement, whereas Downtown Burj Khalifa saw a 9 per cent decline. Prices were down 5-8 per cent in areas such as the Meadows and Springs, Al Furjan, Dubai Motor City, Arabian Heights and Victory Heights. 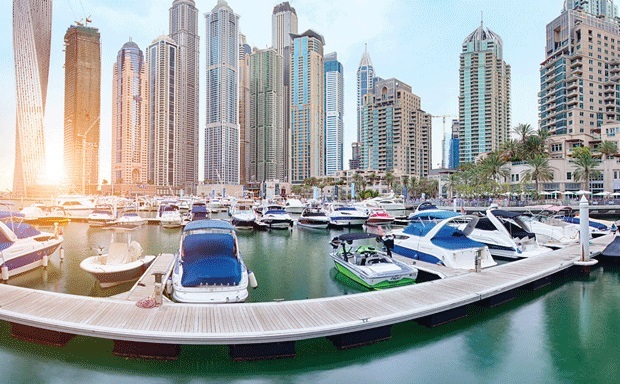 The top transaction areas were Dubai Marina with 1,442 transactions, followed by International City (1,348), Emirates Living (831) and Jumeirah Lakes Towers (733). Dubailand saw 699 transactions. Cluttons says the average residential values have been down by 7.4 per cent during the past 12 months. Despite some submarkets heading towards bottoming out, transaction volumes are still weak and reflect a general nervousness among buyers. Quarterly transaction volumes slipped by 21 per cent in the third quarter, led by a 22 per cent fall in apartment deal volumes, which are down 26 per cent when compared with the third quarter in 2015. The average price of a transacted villa has also fallen by 28.1 per cent since the start of the year to stand at Dh3.9 million. Highlighting affordability as a key theme, Cluttons’ report shows that values over the past 12 months in high-end locations such as Hattan Villas at The Lakes and the Palm Jumeirah, receded by 11.9 per cent and 11.1 per cent respectively, while more affordable communities such as The Green Community and Jumeirah Village registered no change in values in the third quarter. with a slowing in the rate of creation of senior-level executive positions. Affordability is a key point for developers to address when regulatory reforms have favoured end-user buyers over opportunistic investors. Isshak says that the buyer profile today is very different from the historic type, which she says consisted of “foreign buyers, flippers and bulk investors”. While this type of buyer injects cash into the market, improving market sentiment and has a positive impact on the economy, the downside is a “volatile market, controlled by a few and sensitive to external factors”. On the other hand, the current buyer profile consists of “end users, expats, long-term investors and first-time buyers”. This type of buyer creates stability in the market, builds a large pool of buyers that is less sensitive to external factors and encourages expat spending. The downside is lower liquidity, lukewarm market sentiment and lower transactions. New supply will ultimately affect pricing trends. Murray Strang, head of Cluttons Dubai, notes that with 34,000 units unveiled last year, “it’s clear that project announcements are continuing at an unrestrained pace, despite what could be perceived to be challenging trading conditions”. He advises caution amid high expectations. “Although our view of 2017 indicates positive signs to reverse the market’s fortunes, we are closely monitoring the level of residential supply coming to the market,” says Strang. Property consultancy JLL says residential supply will increase by 4 per cent per year between 2017 and 2019, compared with an average of 3 per cent per year in previous years. 30 per cent of all announced projects actually being delivered on schedule over the past few years,” says Craig Plumb, head of research at JLL Middle East and North Africa. 1.5 per cent in the third quarter. The latest change leaves average rents 8 per cent down in the fourth quarter. Durrani says: “Positively, however, apartment rents were unchanged in the third quarter across all the submarkets we monitor, hinting perhaps that this segment of the market may be starting to flatten out. On an annualised basis, villa rents are down by 9.4 per cent, while apartment rents are 5.8 per cent lower than this time last year. The demand for quality office space persists, resulting in more stability. Cluttons says the lack of supply in sought-after submarkets such as Dubai International Financial Centre (DIFC), Dubai Internet City and Dubai Media City, coupled with a relatively buoyant domestic economy, has resulted in rents being sustained. Grade A offices near established commute areas will continue to see good occupancy and healthy demand. However, there will be pressure on prices as companies look to consolidate. Office rents may witness a correction due to weak occupier demand and profitability. Despite Dubai’s continued resilience to global economic factors, compared with other prominent cities in the region, the year is ending with fewer requirements compared to the same time last year. The Cluttons report says that consolidation activities in the finance and banking sector, in addition to the oil and gas sector, which commenced about 18 months ago, is now winding down. The pharmaceutical, legal and technology sectors, on the other hand, are among the most active occupier groups in the market and expansion activity continues from these tenants.